1) Music from within the legendarium, such as fragments from The Road Goes Ever On by D. Swann but also the music that can be found within the works, even though we never actually hear it, only the melodies in our head. Also the recording made of Tolkien singing might fall under this category. 2) Music set within the legendarium; such as soundtracks and incidental music for stage plays and movies. 3) Music inspired by the legendarium; such as ‘all other music’ (associated with Tolkien’s legendarium); such as Unquendor’s own ‘The Hobbitons’ and Blind Guardian’s ‘Nightfall in Middle-Earth’ (sic!). Category number three is the most flourishing of the lot and category number one the smallest. The third category might be divided into two separated sub-categories, the serious (3.1) and the non-serious (3.2) music. To name an example, in 3.1 belongs The Tolkien Ensemble, in 3.2 The Fellowship, a musical parody by Allan Simpson and Joel McCrary. There exists, at least for me, no final verdict on what is serious or not but after listening to so many Tolkien inspired musical works one can but notice a varying degree of seriousness in writing and performing the music. And there is no doubt in my mind that Allen Simpson and Joel McCrary made a serious effort composing their work of art but it was obviously meant to be of a non-serious or parodistic nature. Some might recall Leonard Nimoy’s (Star Trek’s Mr. Spock) caricature ‘The Ballad of Bilbo Baggins’ (1968): in a few minutes it tells all you ever wanted to know about Bilbo’s story involving a dragon. Perhaps musically not so very serious but he got most, if not all, of his facts right. Do we put this in category 3.1. or 3.2.? That’s something you’ll have to decide for yourselves. 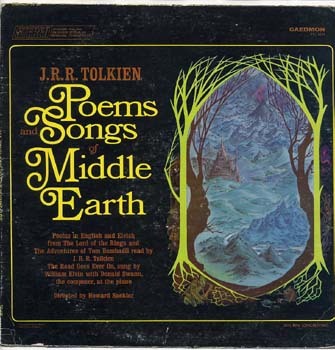 The first references to Tolkien’s work in popular music, to my knowledge, is to be found with Leonard Nimoy’s The Ballad of Bilbo Baggins, it appeared on his record Two Sides of Leonard Nimoy and was released as a single. Nowadays there various youtube video-clip variations. According to Wikipedia in 1967 Nimoy appeared on the Malibu U variety television series where he lip-synched (play-backed) the song before it’s release to the public in 1968. Besides the above mentioned Leonard Nimoy’s song we can find references to Tolkiens work in that same era. For instance the world famous band ‘Led Zeppelin’ made a few references to Tolkien work, but not however in ‘Stairway to Heaven’ (1971). References are made, however, in ‘Ramble On’ (1969) and later in such songs as ‘The Battle for Evermore’ and ‘Misty Mountain Hop’. The band, however, claimed their music was not directly inspired by Tolkien’s legendarium; instead, this was supposedly indirectly and certainly not consciously woven into their music, presumably to avoid lawsuits. On the Tolkien music list website, www.tolkien-music.com, there is a beautiful article about why ‘Stairway to Heaven’ is not a Tolkien inspired song: in short, because Mr. Robert Plant says it isn’t. I rest my case with that explanation. It is known to me that there are some songs influenced by Tolkien dated before 1968, prior to the release of Leonard Nimoy’s The Ballad of Bilbo Baggins, but I can’t find any documentation of a public release whatsoever and thus I assume those songs where home-made songs that never reached a ‘wider’ audience. The very first full length album with Tolkien inspired music, again to my knowledge, would be the Swedish composer Bo Hansson’s album ‘Sagan om Ringen’ from 1970, only one year after Led Zeppelin’s second album (Led Zeppelin II) containing the aforementioned ‘Ramble On’. Bo Hansson’s music is experimental organ music with additional instrumentation performed by Mr. Hansson himself as well as guest musicians. The music is atmospheric and hypnotic with almost danceable rhythms, to me with a hint of elements that lean towards early Pink Floyd songs in a style such as to be found in ‘Set the Controls for the Heart of the Sun’. The music is experimental in the sense that the sounds of the instruments are heavily distorted, but that also makes the work very progressive, and we are taken on a journey through the familiar landscapes with breath-taking melodies and atmospheres. One of the major aspects of this music is that it grows: every time you listen to it you discover new sounds and details. The downside of it is that you’ll need a taste for this kind of music, but I advise not to exclude it from any Tolkien collection, precisely because it is the first full length album ever to be inspired by Tolkien, thus being a historic document. Two of the most remarkable interpretations of Tolkien’s world were created in a radio drama series produced by the BBC. Starting in 1968 with The Hobbit, starring Paul Daneman as Bilbo and Heron Carvic as Gandalf, the book was dramatised by Michael Kilgarriff and the music composed by David Cain. I find the music for this radio drama series of less interest, compared to the 1981 The Lord of the Rings. But in its own right the music fits the series, and that is what it is all about in the end, isn’t it? Many later interpretations such as the Dutch and German versions of The Hobbit radio drama series find their origin with this 1968 radio adaptation. We have all come to know the Middle-earth (musically speaking) of Howard Shore with his contribution to the films of Peter Jackson & Co. And for better or for worse, pending your position of course, this shall dominate much of the Tolkien musical world from now on. But in the late 1970’s there were other films set in Middle-earth, such as Warner’s The Hobbit (1977), Zaentz’s and Bakshi’s The Lord of the Rings (1978), and when Bakshi’s version didn’t prove profitable enough in the cinemas Warner jumped in and did The Return of the King (1979). These are not well known films let alone for people to know the music, if they had seen the films at all. For both their (children’s) films Warner turned towards Maury Laws for the music, and he collaborated with Glenn Yarbrough, who sung most of the lyrics. One of the most memorable and laughable moments, many at Unquendor talk about on occasion, is the scene from The Return of the King with the song ‘Were there’s a whip there’s a way’. With his more experimental (rotoscope) style of filming, Bakshi was able to engage the famed composer Leonard Rosenman for his film. This score has a typical Rosenman style, with lots of brass, and it was typical of its time and age. To an extent he was schooled in the style of Miklós Rózsa. According to Wikipedia “Bakshi wanted to include music by Led Zeppelin but Zaentz insisted upon an orchestral score because he would not be able to release the band’s music on his Fantasy Records label. Bakshi later stated that he hated Rosenman’s score, which he found to be too cliché”. I do not necessarily agree with his statement. Rosenman’s score was traditional, yes, but cliché I think not. I do feel like the composer wasn’t given enough time and space to explore the world of Tolkien and thus falling back on familiarities. People, back in those days, would not expect music from within the film, they would expect music to accompany it. One of the highlights of the music might be the ‘Mithrandir’ song performed by a children’s choir, with lyrics written by Mark Fleischer, and the very powerful ‘Theme from The Lord of the Rings’ which is heard clearly at the beginning and ending of the film. In 1981 came the BBC radio drama series The Lord of the Rings, coming only a year after the American production by Mind’s Eye, starring the BBC series was Ian Holm as Frodo, whom we all know performed the role of the older Bilbo in the Peter Jackson films, and Gerard Murphy, who was the narrator. The Tolkien-based script was written by Brain Sibley and Michael Bakewell, the music was composed by Stephen Oliver. Oliver’s score is very accessible and very beautifully built and woven into the radio play. Two pieces stand out from the rest, ‘The March of the Ents’ and ‘Gwaihir’s Song’. Gwaihir’s Song uses a counter tenor (David James) performing the voice of the Eagle that brings the news of the downfall of Sauron to the people of Gondor. It brings (positively) chills down my spine every time I hear this song, so emotionally sung and performed just beautifully. This soundtrack was released as an LP but has since seen multiple CD and cassette releases of the complete BBC radio drama series. Mr. Corfield Godfrey has written so much Tolkien-based music that it is very hard to make a choice in what to share with you, so I give you a small selection of what can be expected. As said before, Mr. Corfield Godfrey wrote four (stage) opera’s based on The Silmarillion, but he also wrote a variety of operas based on scenes from LotR, including ‘Tom Bombadil’, ‘The Black Gate’ and ‘The Grey Havens’. There is a symphony based on the creation myth ‘Ainulindale’ and a rondo for piano portraying the ‘Akallabêth’. It is very difficult to describe the music of Mr. Corfield Godfrey in just a few words but I would say his music is warm and gentle, but fierce and evocative as well. His most recent Tolkien work would be ‘The Lay of Earendil’. Unfortunately there are currently no commercial recordings available of most of his Tolkien related works. Those willing to change this can contact Mr. Corfield Godfrey through his website. 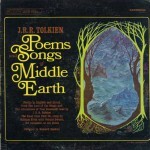 Unique to this music is that for the use of Tolkien’s own words he got permission from both Christopher Tolkien and the publishers. The young Mr. Tolkien even aided Mr. Corfield Godfrey by providing him with insights into (then) unpublished materials. 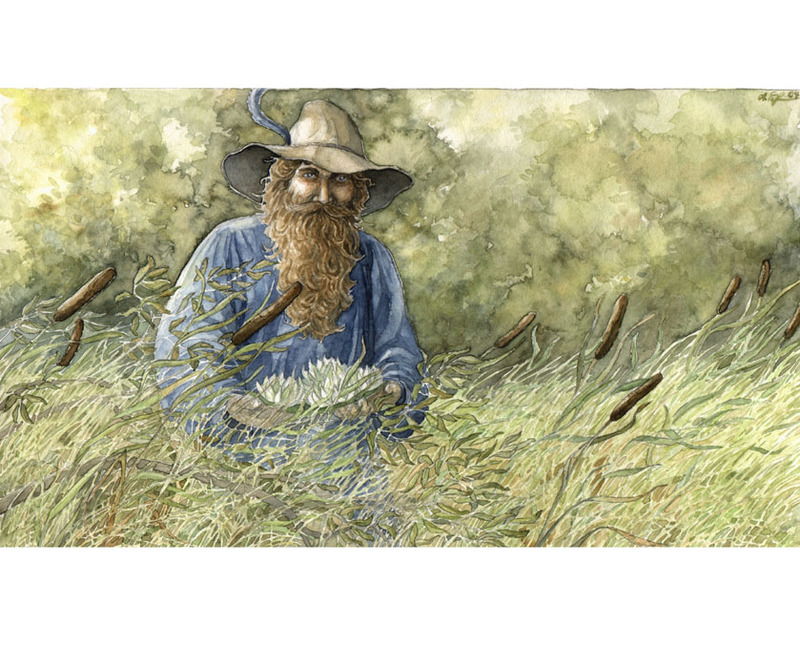 Picture credits: Tom Bombadil by Anke Eissmann. Used by kind permission. Thank you, Jeroen – this is an excellent overview! The sheer breadth of both musical genre and of engagement with and understanding of Tolkien’s work in the music that is associated with him never ceases to amaze me. It is of course fun to imagine how Tolkien himself would have reacted to some of this music (I rather imagine that he would have been … shall we say ‘unimpressed’ with the various sub-genres of heavy metal, even where the music was associated with his work). Just one small point … a number of composers have been allowed by Tolkien himself or the Tolkien Estate to produce and publish music for and with Tolkien’s own words (here I think of the songs from The Hobbit and The Lord of the Rings), from Donald Swann up to and including The Tolkien Ensemble, who, to the best of my knowledge, are still the last ones to receive such a permission.